"Dunkirk" is Christopher Nolan at his finest form. A visual, aural and psychological spectacle, the plot is simple and stays this way throughout its surprisingly slim runtime. But don't let that fool you into thinking that "Dunkirk" doesn't defy boundaries. In fact, it is one of the most memorable and impactful war films we have seen capturing the different triumphs and horrors of human conflict in all kinds of scale. As hundreds of thousands of British and Allied troops are surrounded by German forces in the town of Dunkirk, Operation Dynamo is put into place. The trapped soldiers on the beach with their backs to the sea face an impossible situation but each one, in land, in sea and in air, try to pull off a miracle and save as much lives as they can. The simplistic plot of "Dunkirk" - a tale of everyday heroes, anti-heroes, atrocities, and survival - may make it seem like it is all black-and-white. 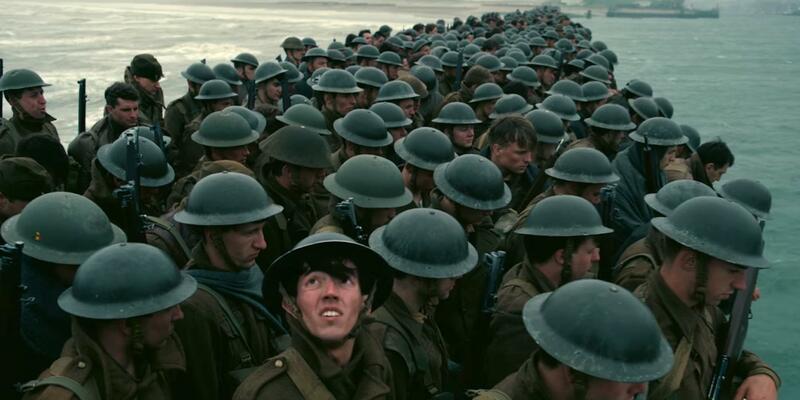 But like real-life, nothing is as simple as 50-50 and Nolan was able to capture that nuance perfectly in "Dunkirk". This starts off with the concept of three distinct stories that outlay the plot on land, sea, and air. Each one having their own distinct timelines (one week, one day, one hour respectively) that implode together near the film's climax. This style not only is unconventional but also captures the different lives of each one involved in that aspect of war. For land, the men that have been stuck on the beach show hatred toward the Navy and Airforce. In the sea, boats sink with lives sacrificed horrifically. In the air, audiences get a glimpse on the heroics of each one even though no one can witness these actions down on the ground or out in the vast sea. Each heroism (or even negative reaction) is impactful but what's more important is you really get to understand why a certain character reacted that way good or bad. A word of warning though. The nonlinear timeline may be a bit confusing but it all works out in the end. In the visual and aural aspect, "Dunkirk" excels even more. The decision for Nolan to use IMAX 70mm cameras as his primary capture device is simply stunning and the decision to use real planes, real boats and little CGI paid off. Even without the visceral gore associated with recent war films, "Dunkirk" feels authentic and just like being in there. Speaking of being in there, the sound effects and soundtrack are of great help. The sound effects are simply outstanding working with harrowing and sudden explosions to keep the fear intact throughout its runtime while the Hans Zimmer's compositions, based on a ticking clock, captures the primal suspense and impending climax in check. While the film plays with a mix of veteran actors and new ones, this is one of its strongest points. "Dunkirk" actually features minimal dialogue of which most are used to provide snippets of details just to keep the audience informed. So most of the drama is eked out from a highly-nuanced performance. Most if not all of the cast delivers. Yes, even a certain newcomer named Harry Styles. "Dunkirk" breaks down the hype train and rams through it with all it has to give and succeeds. It is easily one of Nolan's best films if not his magnum opus.